We won the war in Afghanistan in 2002 and had driven the little of what remained of the Taliban army out of Afghanistan. The Taliban had ceased to be an organized force. How was it possible for the situation to deteriorate so much since then that we now appear to be losing the war, snatching defeat out of victory? The answer is that instead of concentrating on eradicating the Taliban and al-Qaida, we declared war on the cultivation of poppy, in effect declaring war on the Afghan farmer. The Taliban were hated in the countryside because their religious leaders banned the cultivation of poppy in 2000. They were ruthless. The poppy crop as the table below shows fell to almost nothing in 2001, a disaster for the Afghan farmers. When we drove the Taliban out, it was with the support of the countryside which greeted us as liberators. We drove the Taliban out in a lightning war. We thought it was because of our superior forces. Our armed forces are many times more numerous and better equipped today but we are now losing the war. Why? Because the ordinary farmer and peasant now sees the Taliban as liberators and the U.S. as the oppressor. The Taliban leaders (probably advised by al-Qaida) saw their opportunity. They made an alliance with the drug traffickers. In return for Taliban support for the production of poppy, the traffickers gave large sums of money to the Taliban. With the money, the Taliban recruited, rebuilt, and equipped a new army and with the support of the poppy growers retook control of the countryside, handing U.S. and allied forces defeat after defeat. The growers happily recognized the Taliban and responded by producing record quantities of poppy and enriching the Taliban (and probably al-Qaida) beyond their dreams. Opium has long been the major crop of Afghanistan constituting in some years half or more of the Gross Domestic Product. One can observe from the following table why the Taliban became hated in the countryside in 2001and why the U.S. and allied forces were welcomed as liberators. And why they turned on the liberators after 2002 and returned their allegiance to the Taliban. We have confused a war for survival with a failed war on drugs. Our inability to control the domestic consumption of drugs led Congress and administration after administration to externalize it, wasting tens of billions of dollars in an endeavor that was doomed to fail because our interference in the internal affairs of nations for our domestic reasons alienated large numbers of their population and resulted in the election of leaders hostile to the U.S. in such countries as Bolivia, Venezuela, and Ecuador and destabilizing Mexico. After winning the war in 2002, elections were held and a central government installed. At the time, most tribal leaders supported the government. To keep our troops occupied, we began our moral crusade against opium, urging the farmers to grow other products. We destroyed their crops of poppy where we could. 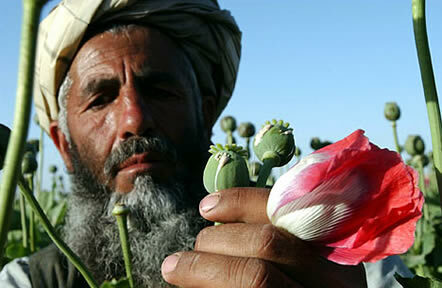 The resurging Taliban offered them protection to continue growing poppies, the chief cash crop of Afghanistan. We allowed a defeated enemy to retake power and to be the effective government of rural Afghanistan, and to build a strong army and government. To win the war, our armed forces are making a huge effort to deprive the Taliban of revenues from the opium trade. The Taliban even has money for mischief in Pakistan. They never would have gotten any money at all if we had not declared war on the cultivation of poppy. We recently announced a change of policy. We shall not destroy the poppy in the fields. We shall prevent the shipment of opium across the borders. We haven’t even been able to prevent the shipment of drugs into the U.S. let alone the porous borders of a giant land-locked country. According to Director Costa of the UNODC, "eradication continues to be a failure". Over the past two years, only 10,000 hectares of opium (less than 4 per cent of the amount planted) were eradicated, at enormous human and economic costs. Mr. Costa called for greater support for farmers, "In post-election Afghanistan, the rural development push must be as robust as the current military offensive - to feed and employ farmers, not just to search and destroy their drugs", he said. We believe this is a waste of time, money, and resources. Have we lost the war? Probably. Can we win it? Perhaps. We would have to declare that we shall no longer interfere with the cultivation of poppy in Afghanistan. To show we are serious, we should encourage the Afghan government to legalize the cultivation of poppy. It should tax poppies and opium as the Taliban have been doing. And to do it right, we ought to legalize drugs in the U.S. as well. Let us recognize the fact that prohibition did not work with alcohol and has not worked with cocaine, marijuana, or heroin. Instead of wasting money as we have been doing for decades, we shall gain revenues instead. We shall gain friends instead of making enemies abroad as we have been doing. We believe the war against the Taliban and al-Qaida is unwinnable as long as the drug war continues in Afghanistan. Dr. Raymond Richman is professor emeritus of public and international affairs at the University of Pittsburgh with a Ph.D. in economics from the University of Chicago. Dr. Howard Richman is executive director of a nonprofit (Pennsylvania Homeschoolers Accreditation Agency) and an Internet economics teacher. They are co-authors with Jesse Richman of the 2008 book Trading Away Our Future published by Ideal Taxes Association.